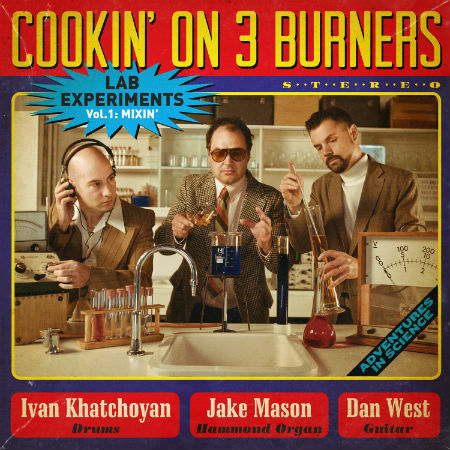 After stumbling upon on a disused time machine, Cookin’ On 3 Burners are propelled back to the year 1971, where upon breaking into a local high school science lab, they cautiously combine the elements and mix together the perfect ingredients to bring about the creation “Lab Experiments Vol.1: Mixin”. They’ll be bringing their high energy to the stage, hitting the road on an east coast tour this June. Scorched onto Apex 456 analogue tape and made available on a vinyl, CD and digital bundle, the 8-track album brings it all back to the heat of Australia’s hardest hitting Hammond Organ trio. The band are captured in full flight with the right blend of sweet soul and dirty dance floor funk that comes on strong until you get up off that thing and shake it! In true Burners fashion; it’s all live and full of vibe. The chemistry is right for some tasty collaborations, with the cracking lead single “Real Life Baby” featuring UK singer/songwriter Emmi, which just recently hit #1 on AMRAP’s regional charts. Dynamic vocals from Stella Angelico on the track “Sweet Talker” and long time Burners collaborator Kylie Auldist laying it down on “More Than A Mouthful”. The trio also serve up the video clip for their breakbeat flip of Metallica’s iconic “Enter Sandman”, set to be a future classic for break-dancers on New York City subways. Joining the dots between Deep Funk, Raw Soul, Organ Jazz and Boogaloo, Cookin’ On 3 Burners were always meant to be an experiment in sound since their inception in 1997. 2009 onwards saw them hit #1 on the UK iTunes RnB charts with the track “This Girl”, and in the last 20 years finding their home at UK label Freestyle Records, having songs featured on a string of hit TV shows and play alongside acts such as Alice Russell, Quantic, Sharon Jones & The Dap Kings and Fat Freddie’s Drop.